Monica Gale Top STAMPIN'UP! UK Demonstrator: HAPPY ST PATRICK'S DAY!!! ....if you do celebrate it. We do every year in spite of not being of Irish descendancy. You see St Pats is very special to me and hubs as it was 13 years ago when we got together at a party. I blame it on the Campari and Orange hubs blames it on Guinness. And we do have a little bit of a anniversary going on, he never forgets and true this morning I got up to a box of O'Brien Chocs (apropriate) a cute leprechaun card, a bottle of bubbly ( I love bubbles) and.......... A SWEAR POT!!! Now before you even think about that one I just need you to know that I DON'T HAVE a swear problem and I'm not sure what he means by it LOL. I am sure those of you that know me will let me know if indeed I have such problem. Anyway I got him bottle of single Malt and made a leprechaun card as well. Isn't it cute? he is made entirely from punches and is holding a pint of Guinness !! Perfect hubs card hee hee. Garden Green card stock stamped with the Medallion background, a variety of Stampin'Up! 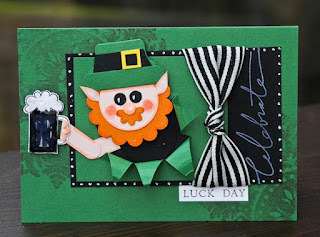 punches for the little guy, beer mug from the Cheers to you stamp set and a sweet sentiment that spells **Celebrate Luck Day ** as it was a very lucky day for us both. What a great idea for a card!! Fabulos!! Enjoy your special day!! Of course you don't frickin have a bloody swear problem.. lol..
ps.. love the card - he's too cute! Hi Monica, you are sooo creative!! Incredible!! I love the little fella, very cute. Love the card Monica, very clever with those punches! What a darling card! Love the way he's popping out of the card! love your st.patrick day card.